I've always believed that talent is distributed equally across our country, but what frustrates me is that opportunity hasn't been as evenly distributed. That has been the case in many cities, but it has been particularly true here in Detroit, especially for our young men of color. In our city, we've recommitted ourselves to making sure that opportunity is being extended to all Detroiters. President Obama's My Brother's Keeper initiative is a central part of our strategy to change outcomes for young men of color. In fact, more than 50 leaders from Detroit's civic, corporate and philanthropic communities and I have committed to accept President Obama's challenge. Clearly, a city like Detroit, which is 83% African American, can't succeed unless its young people of color succeed. One of the ways we are working to live up to the goals of My Brother's Keeper is through our summer youth employment program, Grow Detroit's Young Talent (GDYT). Last year, with the help of our business community and foundations, Detroit provided summer jobs to 5,600 youths ages 14 to 24. These young men and women had experiences ranging from learning skilled trades while boarding up vacant schools to learning finance, accounting and public policy. 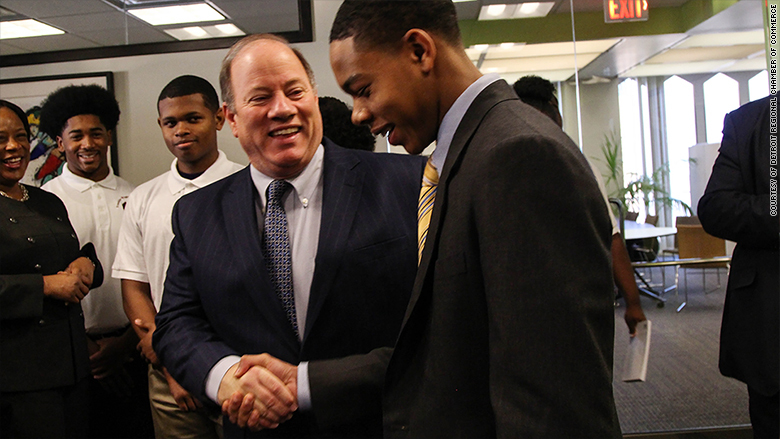 Detroit Mayor Mike Duggan greets Trayvon Stearns, 17, a graduate of the mayor's Grow Detroit's Young Talent program. Last year, Trayvon spent his summer working in the Mayor's Office. That means 17-year-old Trayvon Stearns was able to take his experience working in the Mayor's Office last summer with him as he began studying business administration at the University of Michigan in the fall. It means that 16-year-old Jasmine Dickens now has contacts, relationships and experience after working last summer in one of Detroit's top law firms as she pursues her dream of becoming a lawyer. That's what summer jobs should be about. This year, we are being more ambitious and are very close to our new goal of placing 8,000 Detroit youth into similar summer work experiences. - About 54% of African-American and Hispanic males 24 years old and younger live in poverty in our city. - Unemployment in Detroit, while down from nearly 20% two years ago to about 11% today, is still the highest in Michigan. - Only 62% of our city's African-American and 55% of our Latino young men are graduating from high school. - It's estimated that only 33% of African-American and 28% of Latino third-grade males were proficient in the reading section of the fall 2013 Michigan Educational Assessment Program test (MEAP). Of course, there is no greater gateway to success than education. Perhaps the most impactful program we have initiated is the Detroit Promise, which provides two years of tuition-free college for graduates of any Detroit high school -- whether private, public, or charter. The Promise also funds programs to ensure student success, such as programs in high school and mentors and coaches on site at the community college campuses. We've also worked with Detroit Public Schools and the Education Achievement Authority to reduce suspensions, expulsions and chronic absenteeism of boys of color by 50%, helping to keep them from dropping out. Our neighborhood District Managers are working with the Skillman Foundation to roll out reading spaces in up to 100 local barbershops this summer, to keep young people engaged and learning. Though we have a long way to go to reverse the decades of neglect of our young people of color, we are making progress. A recent report released by the national Campaign for Black Male Achievement rates Detroit highly in the fight to create more opportunities for African-American men to succeed. In its rating of 50 U.S. cities that are addressing the achievement gap, I'm proud to say that Detroit came out on top among them, scoring 95 out of 100. Behind these statistics are real people, like Terrence Gore. In April 2014, having just returned from incarceration, Terrence was an unemployed resident of Detroit's struggling Brightmoor neighborhood. Under a grant from the Skillman Foundation, Terrence was trained as an asbestos abatement contractor. He was initially hired earning $16 per hour to remove dangerous asbestos from blighted homes that were being demolished in his own neighborhood. He's made the most of his opportunity, and is now making $39.55 per hour supervising others. Just a few weeks ago, Terrence stood alongside the Rev. Jesse Jackson and myself as we announced Detroit's first Opportunity Fair for minority-owned demolition and home rehab contractors. There is more work to do in Detroit, but Terrence's example shows us the impact we can have on our young men of color, and our city, when we help talent meet opportunity. 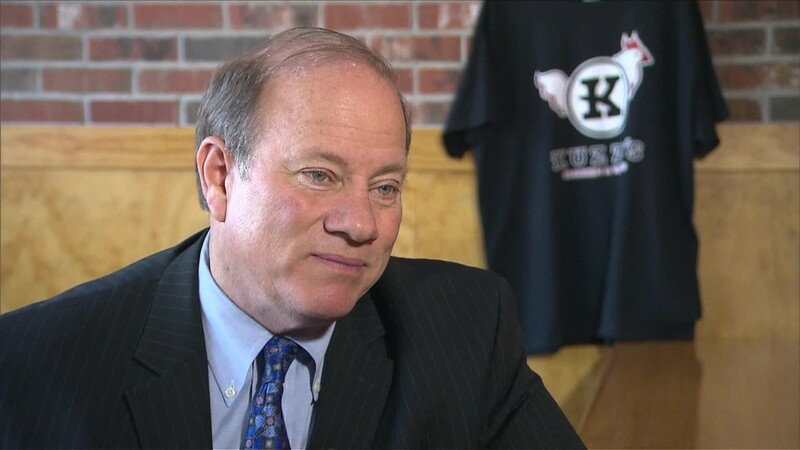 Mike Duggan is the mayor of Detroit. The opinions expressed in this commentary are solely those of the author.